As part of Swords &Wizardry Appreciation Day. This post is an attempt to explain briefly why Swords &Wizardry is my Retro clone (a reversed engineered version of one of the earlier editions of D&D using the D20 Systems Resource Document) of choice. You can down load the rules at the games website, Lulu.com or view them online at the Swords and Wizardry Systems Resource Document. This gives you the option to try before you buy, the internet equivalent of a good browse through the book. Is this Old School Thing for me after 20 or so years not playing any version of D&D? It took a lot of convincing and easing in for me to return after such a long time away, having a zero cost version that was well laid out and clear, helped me immensely. Next I really wanted a book in my hot little hands. Fortuitously the Black Blade Publishing Edition of the Core Rules just showed up for about 5 minutes in one of my local gaming shops. I made sure I was there in those five minutes and it was mine! I was impressed, with its no-nonsense approach. This was the Core version of the rules, which I like as a tight little version of the Game. So it was abundantly clear that this is not just some free role-playing thing, which for some people strangely enough is a big turn off. Care and attention to detail was being spent on producing something that was a serious professional product. For those of you not in the know there are three versions of Swords and Wizardry. 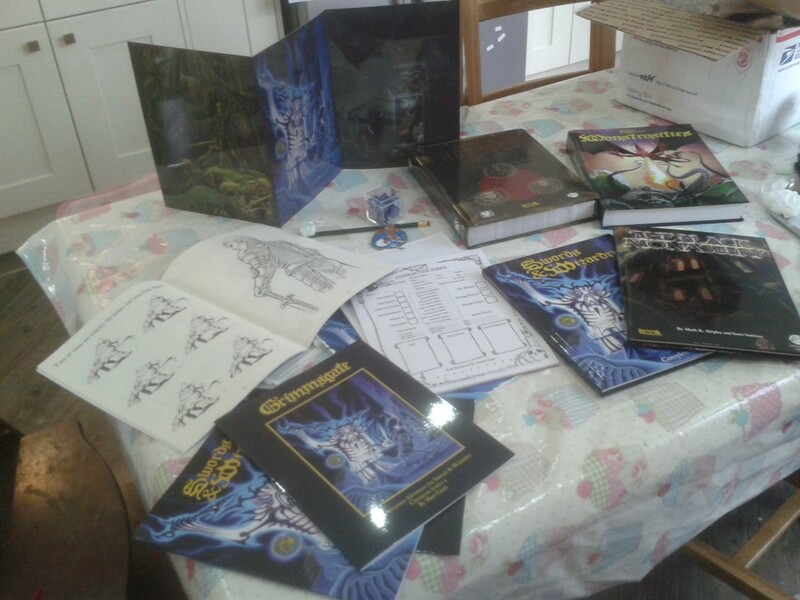 White Box – just the three original D&D books , a short concise version of the game. Complete – All the rules from OD&D + supplements, so you get all the subclasses (Paladin, Bard, Monk etc). So sort of a striped down AD&D. Frog God Games – Complete + a vast selection of S&W modules. Still very community friendly but this is the more commercial side. Reason 3. SIMPLE NO NONSENSE RULES! In my opinion this is the Game before it suffered rules bloat. The classes are manageable, the spells are straight forward and not too numerous ( a big deal for me when the players expect me to carry the details in my head), there’s enough treasure and monsters in the main rule book with enough detail to get stuck in an designing a dungeon quickly. Its easy to teach to newcomers, yet still instantly recognisable to old hands (like a bike you never forget how to ride). I like games that don’t get in the way of my role-playing and S&W serves that up in spades. Reason 4. ITS GOT A COMMUNITY! As well as the usual site and forum, there were numerous Blogger sites, collectively known as the OSR Blogsphere, supporting the game (and other Retroclones) with new content and reviews. Throw Google Plus into the mix, which supports Hangout games (some of which are recorded), you’ve got a friendly, open minded, active group of players and Gamesmasters all buzzing away 24/7. As a publisher this was a very attractive proposition. One which I took up by writing Crypts and Things, a variant of the rules with a focus on UK Old School rules and attitude , with a definite Swords and Sorcery Flavour. Without Swords and Wizardry, and Araskia’s Swords and Sorcery House Rules I would have never written the game. Reason 6. IT EVOKES THE GOOD OLD DAYS OF 80s UK FRP! Even without my Crypts and Things variant that tunes in that vibe directly, S&W invokes nicely the early days of 80s UK gaming. Stuff like the early White Dwarf issues, which had mad DIY stuff in like the Halls of Tizun Thun (adventure), the Barbarian (Class), not to mention regular columns like Fiend Factory and Treasure chest, and of course the early Fighting Fantasy. In many ways this is the most important thing about S&W, and even though I never played OD&D it inspired much of my early gaming sources. Swords and Wizardry Systems Resource Document. This entry was posted in Crypts & Things, Swords and Wizardry by Newt. Bookmark the permalink. While it may not be my first choice for an old-school game, it is certainly a good game. And all the reasons you list are perfect reasons for picking it up. By the way, congratulations on C&T making DriveThruRPG’s top ten OSR rulesets.